How Many Goals Did George Doig Kick? During his career, George Doig kicked 10 or more goals on 14 occasions. This compares well to Jason Dunstall with 17 occasions, and Tony Lockett with 16 occasions. He never missed scoring a goal in any match he played. In 1938 the East Fremantle Football Club played a match in Sydney against the New South Wales State team. A newspaper report on the match referred to George Doig as “the Bradman of WAFL football” as he had by then achieved more than 100 goals in six consecutive seasons. George kicked an aggregate of 1083 goals in his nine consecutive seasons from 1933 at the East Fremantle Football Club. This represents an incredible 120 goals per season and 5.46 goals per game. In 1945, after an absence from the game for three years due to the Second World War he returned to play a few more games, kicking a further 28 goals, to bring his career aggregate to 1111 goals. 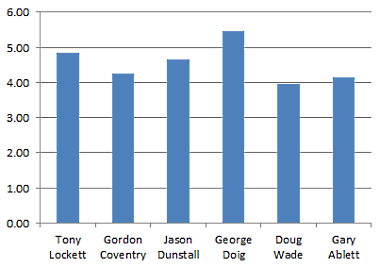 The graph below displays the total amount of goals kicked by the 5 best goal kickers in VFL/AFL history and includes George Doig. 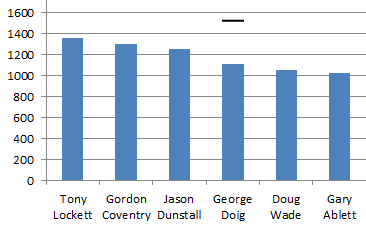 The black line shows the total George would of reached if he had of played the same games as Tony Lockett while maintaining his own average. the 5 best goal kickers in VFL/AFL history plus George Doig.